Holt & District Dementia Support was initially formed to provide a weekly drop-in café offering information and support to those living with dementia and their carers, known as ‘The Poppy Café‘. 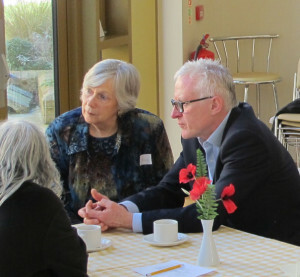 It aims to support the well-being of both clients and carers, and to increase public awareness of dementia in the area. In response to the views and concerns of those attending the support group, a successful Home Visiting Service was established, offering respite to carers who look after people with dementia in their own homes. The group’s latest venture is to show the occasional vintage film at Holt Community Centre. All are welcome to attend the films, which are run through the Poppy Cinema. Since the inception of the H&D DSG in April 2014, the group has become a member of the North Norfolk Clinical Commissioning Group Providers’ Forum. In December 2015 the group joined the Dementia Action Alliance. The DAA brings together organisations from across England which are committed to transforming the lives of people with dementia and their carers. On Thursday 14th April 2016 our group was greatly involved in the Launch of Holt as a Dementia Friendly Community. This was a memorable and moving evening for all who attended the event. In recognition of the work of the Holt & District Dementia Support, the committee and volunteers felt privileged to be presented with the Holt Honours Group Award for 2017. The presentation by the Mayor, Duncan Baker, took place on 27th March at the Town Council’s AGM. 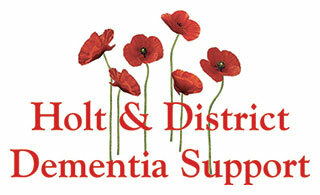 A printable brochure of the Holt & District Dementia Support brochure may be downloaded as a pdf. Norman Lamb MP (then Minister of State for Care and Support), visited the Poppy Centre in February 2015. Open every Tuesday from 10.30 - 12.30 at the Meeting Room, St. Andrew's, Holt NR25 6BB. Come and join us! Poppy Cinema – “Some Like It Hot”, will be shown on Wednesday 12th June following the very successful recent showing of “The African Queen”.